Support the Warm Line's efforts to secure continued program funding by calling your local representatives. Below, we have phone numbers you can call and some sample scripts to voice your support. **San Francisco Residents may contact Senator Scott Wiener as well as Assembly members David Chiu (415-557-3013) and Phil Ting (415-557-2312) to encourage them to support the Warm Line. Show local representatives that we want them to allocate funding so the Warm Line can return to 24/7 service across the state of California. 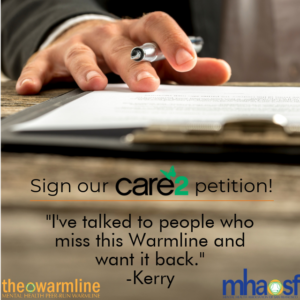 Join over 43,000 Warm Line supporters with your signature!